If you’re still paying for your desktop security suite, you’ll be happy to hear that McAfee on Monday released the newest editions of its security suites. The new lineup includes McAfee AntiVirus Plus 2015, McAfee Internet Security 2015, McAfee Total Protection 2015, and McAfee Live Safe 2015 for Mac and Windows. Pricing was not announced, but Amazon has AntiVirus Plus 2015 for one PC listed at $40, Internet Security 2015 at $50 for one PC, and Total Protection 2015 at $60 for one PC. Finally, McAfee LiveSafe, a cloud-based service that encourages you to store sensitive data online behind voice and facial recognition authentication, will set you back $80 for access across all your devices—mobile electronics included. Each price gets you a one-year subscription. 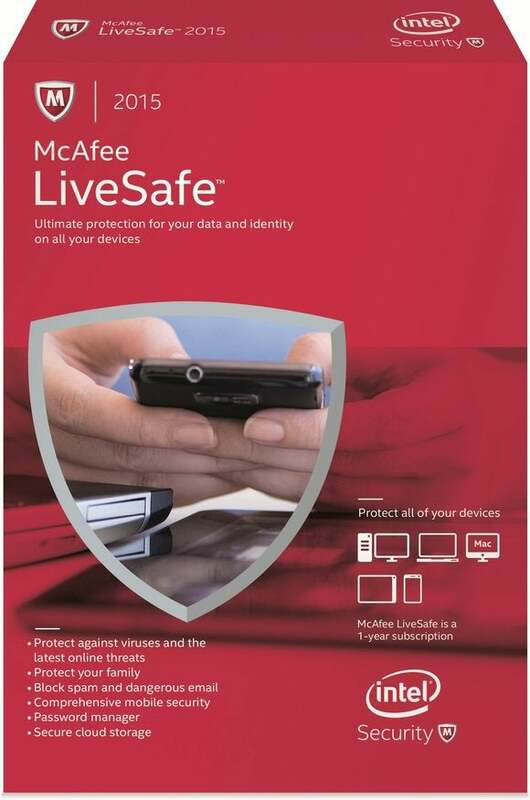 As for new improvements to the software, McAfee says it upgraded the malware detection engine across all its suites to “improve detection and device performance.” McAfee LiveSafe also now lets you add new devices to your subscription with just one click, and McAfee says LiveSafe’s biometric authentications will let you “safely store sensitive and personal information such as wills, deeds and passports in a secure cloud storage vault”—though I’d recommend thinking twice about putting any documents that sensitive in the cloud. The last version of McAfee’s LiveSafe suite impressed our reviewer, but if money is tight, it’s also possible to cobble together a comparable security suite at low or no cost, albeit at the cost of McAfee's simplicity. In fact, if you’re running Windows 8 and RT, Microsoft’s Windows Defender comes baked-in to your system offering real-time protection against spyware, viruses, rootkits, and other malware, online and offline system scanning and cleaning, and enhanced protection against rootkits and bootkits. Likewise, several free mobile AV options are available, and both Google and Apple are very efficient at keeping malware out of their official app stores. If you need to store passwords and sensitive documents in the cloud then check out LastPass for your password needs and encrypted cloud services like SpiderOak for storing documents. LastPass is just $12 per year (or free if you don’t need mobile device access) and you can get 2GB of SpiderOak’s "zero-knowledge" encrypted cloud storage for the low, low price of nothing. McAfee’s Personal Locker, part of the McAfee LiveSafe subscription, maxes out at 1GB. The key to using LastPass and SpiderOak securely is to make sure your master password for each service uses a set of unique, random characters and is at least 10 characters long. You should also enable two-factor authentication on services where it is available. That said, if you feel that suites like McAfee’s do a better job at protecting your PC and mobile devices than the free or low-cost protection software—or you simply don’t want the hassle of keeping tabs on several discrete security programs and apps—then McAfee’s protection suites are probably worth it for you. If you’re not sure, however, you might consider giving the free options a try first.